Info:Ulf Christiansson: vocals, guitar | Anders Mossberg: bass | Klas Anderell: drums | Dan Tibell: keyboards | All songs by Ulf Christiansson, except for "Dagarna går" by Dan Tibell. Released 1998 in Scandinavia only on Fruit Records and MEP. Only in Swedish. 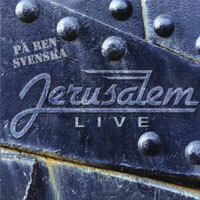 A double CD “live” recordings in Oslo, Arendal, Vennesla, Norway and Jönköping, Värnamo, during the “Korståget” tour in Scandinavia April-May 1997. Powerful liv! e presence by Jerusalem / Klas, Anders, Dan and Ulf. Testimony by Ulf and a drum solo by Klas with much joy and power. Listen to “Sodom”, “Moderne Man”, “Jag vill ge dej en blomma”, “Noa”, “Längtar efter mer av dej”, “It’s mad”, “Pappa vem har gjort” and many more classic songs from Jerusalem. Live engineers Reidar Paulsen and Ruben Gabrielsson, Norway. Mixed at LA studio Stockholm by Fredrik Appelkvist.